School enrollment is declining. Budgets are shrinking. Faced with these realities, more and more school districts are choosing to renovate rather than replace existing schools. In 2006, the American Association of School Administrators polled 14,692 school districts and found that over half were experiencing declines in enrollment. Enrollment decline is often most acute where school buildings tend to be the oldest. Recent studies show that of the nearly 100,000 public schools in the United States, 76% of them need repair, renovation, and modernization. The average school is 42 years old and was not designed to meet the demands of current or future technology and in some cases fails to meet basic health and safety codes. School districts throughout the country are faced with the challenge of teaching students with less per capita funding in old buildings that lack access to technology or areas for individual or small group instruction. 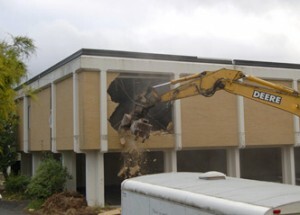 So why are school districts choosing to renovate rather than replace tired facilities that are well past their prime? In contrast, Michigan’s neighbor state of Ohio has established the Ohio School Facilities Commission (OSFC). The commission works as a partner with school districts to evaluate each school building from both a structural and educational standpoint. OSFC works closely with local communities to ensure that, whenever possible, schools should be renovated and upgraded to accommodate 21st Century systems and equipment. In an effort to help proponents of school renovation, the National Trust of Historic Preservation published Historic Schools: A Roadmap For Saving Your School. The National Trust contends that all too often, historic schools and options for renovation are routinely dismissed without full consideration of alternatives or community input. Many schools are abandoned or demolished simply because of their age. The roadmap publication is intended to help residents, parents, elected officials, or school board members get started in asking the right questions and building public support when considering or advocating the saving of a historic neighborhood school. Modernization can save money which is crucial as enrollment and per capita funding continue to decline. Savings realized through renovation can be put to immediate use in serving the educational needs of students. Visit SAFTIFIRST‘s website to learn how our innovative SuperLite fire-rated glazing products can enhance the interior environment while increasing student safety in your current or upcoming school renovation project.